The Government will pay to have your cyber security tested! 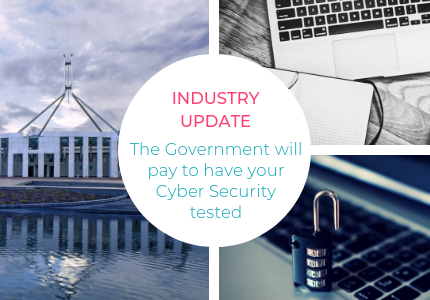 The Australian Federal Government will assist you with the cost of testing your cybersecurity. However, as 2019 kicks off you may want to make this a priority. Whilst applications are open until 30 June 2020, the fund will close earlier if funding is fully committed. Grants will be provided to small businesses (with 19 or fewer employees) for up to 50 per cent of the cost of a micro, small or standard certified small business check. These health checks are essentially the same but vary in price depending on the number of devices that are tested. The maximum grant amount is $2,100. Edmund works closely with a network of IT Security Professionals including many that are CREST certified as required for the grant. If you would like an introduction to a CREST approved provider, simply email us HERE. The new year is also a perfect time to consider a specialist Cyber Insurance solution. In 2018, SME’s identified the biggest threat to their business as being loss, theft or misuse of their data (Allianz). The fears are justified, according to PWC in the last two years, 45% of Australian companies were attacked by online criminals. As of last year, businesses can be required to report Notifiable Data Breaches to the OAIC and affected individuals. With the laws approaching their first anniversary it’s widely expected the Regulator’s grace period is coming to an end with fines to follow for organisations and directors found to be in breach. A 2018 HP Australia IT Security Study revealed many Australians are choosing not to share their personal information with SME’s, likely due to growing privacy concerns, despite SME’s indicating this data is critical to their success. The change in consumer sentiment towards data protection hasn’t been lost on lawyers as actions and contract disputes emerge in increasing numbers. As businesses come to realise their legal exposure and operational dependency when it comes to cyber risk, Cyber Insurance is a valuable tool to reassure counterparts. What will you do when you’re attacked? The post-breach environment is more complex than ever and for most SMEs assistance is vital for survival. Edmund’s Emergency Response service provides you with 24/7 IT security, forensic and legal assistance from breach specialists to get your business back up and running. Edmund’s cyber insurance solution includes Emergency Response powered by KMPG. Your business package insurance policy doesn’t cover cyber risks and will leave you uninsured if you suffer a loss. Cyber is a specialist area of business risk and only a specialist provider can provide you with the confidence of comprehensive protection. Edmund has made Cyber Insurance Fast, Easy and Simple. You can get a quote now in 7 minutes by clicking HERE.